Happy Book Birthday: WAITING FOR UNICORNS! 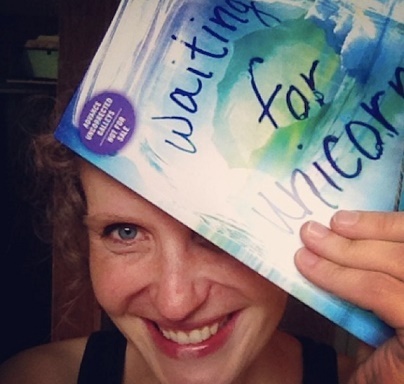 I am so excited and thrilled to announce that today marks the release of WAITING FOR UNICORNS, the amazing Middle Grade novel by my great friend and critique partner, Beth Hautala…now a debut author!! Congratulations, Beth! How seriously great is this picture?? Talia McQuinn is much too old to believe in magic, yet she keeps a jar of wishes under her bed. When her whale-researcher father drags Tal to the arctic for the summer following her mother’s death, she brings the jar along. During her stay, Tal learns the ancient Inuit legend of the narwhal whale—the unicorn of the sea—and she forms a plan to make the biggest wish of her life. When the entire population of whales in the Hudson Bay mysteriously disappears, and an accident endangers the life of her new friend, Tal must confront the truth: no wish on earth can grant escape from her heartache, or bring her mother back. But sometimes, the release of one wish makes way for the granting of another. I came across the first 250 words of WAITING FOR UNICORNS in 2010 as an entry in the Bakers Dozen Agent Auction on Miss Snark’s First Victim’s blog. Beth’s lyrical writing pulled at me immediately, lulling me into a world she created so beautifully. I knew with certainty that I would see this book in print someday. I didn’t know Beth at the time, but I knew that her book was special. Now that I’ve read the entire story, I can tell you with even more certainty this is a book I will never forget. Talia is a character readers will be drawn to from the start, maybe because of her circumstances—she has experienced a loss no child should ever have to, but more likely because she is full of hope even when she feels there is no more to be had. She is full of wonder, even though her new world feels unfamiliar and strange. And she isn’t afraid to wish. And wish she does, with the help of her wish jar, a few new friends, and some very difficult to find unicorns. WAITING FOR UNICORNS is an uplifting adventure that takes readers on a sweet journey to the arctic where the descriptions are so vivid, they may just need to wear their own wool hat and mittens. The characters are refreshing and real. Readers will root for Talia on each page as she searches for her unicorn and tries to piece together her broken heart. Several things stood out to me as I read this book. Beth Hautala writes with such amazing beauty and grace, it’s as if she spent a lifetime choosing each and every word, precisely for this story. She has developed a world so splendid and different from what most of us know. I felt grateful to have experienced all that she exposed me to. And she created characters so real and a story so relatable that I just may feel a long lasting connection to both. And so it’s finally here. Cheers to Beth and her newborn book! May it live a long and sparkly life in the hands of young readers everywhere!